The East Oakland artist is on a mission to prove the handicrafts are art, not trinkets. 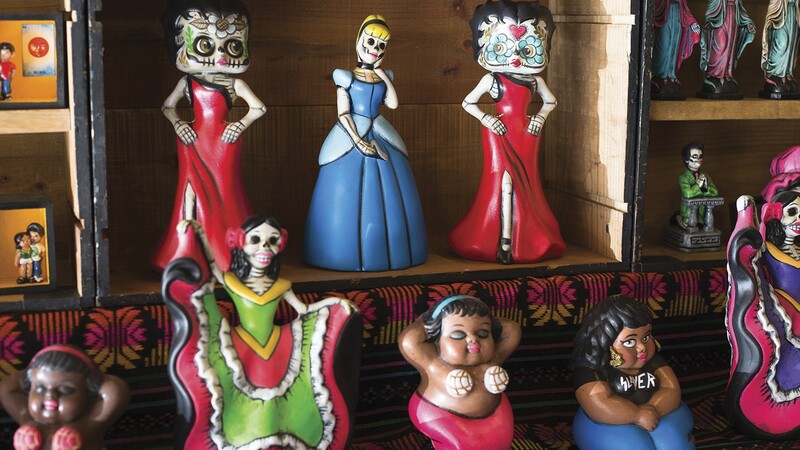 Figurines get jazzed up with Mexican touches, like conchas for coconuts. Much has been written about Latinx visual artists and their contributions to the local and national art world. However, there's an art form that, while not as common in the United States, remains a crucial part of Mexico: folk art (artesanías). Folk art refers to creations often crafted by indigenous people or those with no formal artistic background or training. The art is all handmade: pottery from the states of Jalisco, Puebla, and Oaxaca; silver jewelry from Guerrero; leather goods from Guanajuato; hand-blown glass from Tonalá and Tlaquepaque, Jalisco; or textiles from anywhere in the country, for example. If you watched the Pixar movie Coco, then you have seen one of the most intricate artesanías: vibrantly hand-painted alebrijes originated in the state of Oaxaca. (In Coco, they were the spiritual creatures Pepita and Dante.) Each piece is carefully crafted and deeply rooted in the social, economic, and cultural life of different regions within Mexico. 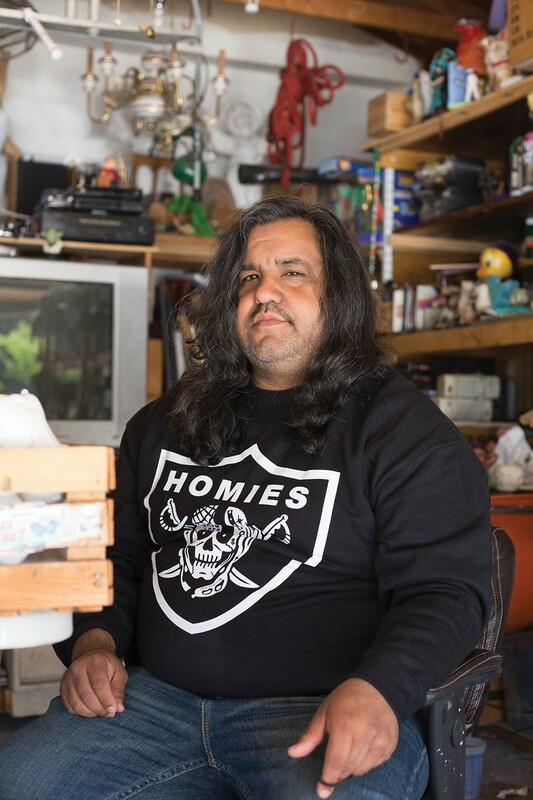 Oscar Cisneros is a local folk art artist who is using his Oakland upbringing surrounded by art and graffiti artists — being a former tagger himself — while mixing his Mexican background to bring light to this art form unknown to many. The Oakland native grew up in the Fruitvale district. For most of his life, the one piece of art that he would see daily was the mural by Xochitl Guerrero painted next to La Clínica de la Raza. The painting depicts an array of cultures and their healers, along with doctors and religious figures. The original mural was painted in 1977 by Guerrero's father, Raymundo Nevel. A few years ago, Cisneros had a thriving storefront located in Fruitvale, feet away from the Dimond district. Unfortunately, a change in building ownership forced him to close the shop last spring, but the lack of a permanent space has not derailed his artistic flame. On the contrary, he is using social media as a way to keep connected to his former customers and continue selling his art, whether through pop-up events or commission work. He will be selling some of his artwork at a Star Wars-themed show at Amor Eterno Arte on May 5. "It is such a wide umbrella that is often just seen as trinkets or souvenirs," Cisneros said. "After spending so much time in one particular town [Tonalá, Jalisco], ... it started reflecting on my art enough to call myself an artisan." It was his frequent trips to this region of Mexico that has profoundly influenced his work. Tonalá is known for its pottery, and the city even houses the Museo Nacional de la Cerámica (National Museum of Pottery). He would often just watch the artesanos and how carefully they would craft each piece they were working on. "It was zen-like, and a slow process of learning," Cisneros remembered. He hunts for figurines all over — you can find him at thrift shops, the flea market, and even the White Elephant Sale. "I often look for pieces lacking in life, warmth, and color," he said. "How can I transform it into something else?" He wants his pieces to represent who he is and the intersectionality of his American and Mexican roots. A recent piece he worked on depicts a dark-skinned and voluptuous Wonder Woman, in distinct contrast to the DC comics character. Cisneros is also aware of the many ways artesanos in Mexico get taken advantage of when people from the United States cross the border to buy wholesale and then re-sell the folk art for much higher back in the States. "It is a white savior attitude," Cisneros said. "But what's left off the conversation is how the artesanos feel. Often, these wholesale buyers represent a significant percentage of their sales." There has been the occasional controversy whenever a new e-commerce shop pops up selling Mexican folk art. Most recently, the Instagram shop Mexitrend was flooded with angry comments accusing it of cultural appropriation for profit. Cisneros hopes to open a design shop in Tonalá that will be a cultural bridge between Mexico and the United States. His ultimate goal is to promote the rich culture of Mexican art and use it as an educational tool, showing that Mexican folk art is not lower quality — that it deserves respect, not just for the art, but also for the hard work behind each piece made by a local artist. "Speaking, sharing my beliefs is tough," he said. "Everything I could possibly say is reflected in my artwork."